Disapproval of President Donald Trump is rising among white millennials, but it’s still below that of their black, Latino and Asian-American peers, according to a survey released Thursday. The GenForward poll shows that whites have joined the majorities of young adults in all racial and ethnic groups in disapproving of Trump’s performance. That disapproval among whites grew from 47 percent in the group’s May survey to 55 percent in its most, which was conducted between June 23 and July 10. Meanwhile, 76 percent of blacks, 68 percent of Latinos and 67 percent of Asians disapproved of him in the last survey — rates that were fairly consistent with the previous one. 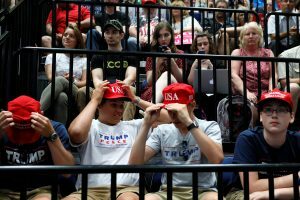 Conversely, Trump’s approval ratings ranged from a low of 10 percent among black millennials to 29 percent among whites in the most recent survey — marks lower than that of the overall population. An ABC News/Washington Post survey of random U.S. adults that was taken at Trump’s recent six-month mark showed he had a 36 percent approval rating, which was the lowest at that point for any president in at least 70 years of polling. Vanessa Von Burg, 33, participated in the survey and is among the white millennials who voiced disapproval of Trump. The student who lives in Indianapolis said she isn’t surprised to see the growing dissatisfaction. “I never had approval for Trump … and my opinion has gotten worse,” said Von Burg, a California native who added she is in a long-term relationship with an Asian-American man. A larger split emerged when respondents were asked if Trump would do what’s right for the country. The latest GenForward survey found that 58 percent of whites said he would most or some of the time, while majorities of black and Latino respondents said he never would. There was also a divide in opinion on how elected officials should govern. Sixty-three percent of white millennials said Democrats should cooperate with Trump and other Republicans. Similar majorities of black, Latino and Asian-American respondents disagreed, advocating for “explicit resistance,” the survey found. “In the larger discussion of around ‘how do we reach across party lines,’ if there isn’t much agreement among racial groups on how to do it then that makes the conversation that much harder,” Vladimir Medencia, one of the researchers, told reporters during a conference call. Millennials are members of the generation born from the early 1980s to the late ’90s. They also are referred to as Generation Y.
GenForward is a bimonthly national survey of about 1,800 adults ages 18 to 34 conducted by the University of Chicago that has a margin of error of plus or minus 4 percentage points. It is designed to be representative of the young adult population but pays special attention to the voices of people of color, highlighting how race and ethnicity shape the opinions of a new generation.